Well-made, cool-looking, and definitely not like any ordinary bookends you’ll find just anywhere. 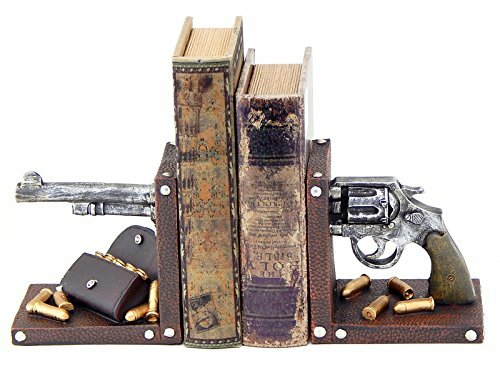 These bookends are a perfect complement to book collections or firearms home decorations. Get a pair now for that loved one or friend who’s a either book-lover, vintage-lover, and firearms aficionado, or all of the above. This gift will definitely be loved. Are you looking for a way to update a room, like a library or a man cave? Do you want a decor that can really show off the things that you are passionate about? Here is one beautiful item that will surely stand out in any room you put it in. 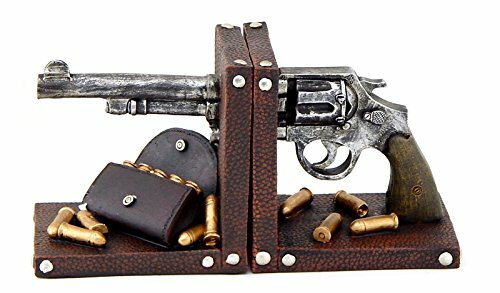 These vintage styled bookends that feature a revolver pistol which seem to be cut in half, with the barrel of the pistol on one bookend, and the cylinder, the trigger, and the grip on the other bookend. It also has a pouch full of bullets as part of the embellishment. 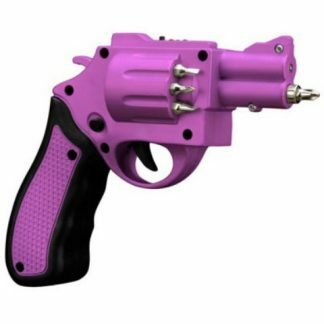 However, nothing to worry, the gun and the bullets are all made from fine cold cast resin, and though they might look real, they are just some realistic looking gun decoration. These bookends would look great in any bookshelf, side table, or console table. It has a nice antique feel to it and it is sure to be an eye catcher and a pleasant conversation piece for guests. While without doubt, it would be a great fit to any room designed with a cowboy or western interior, these bookends can easily work with a variety of design aesthetics that can range from traditional to country. 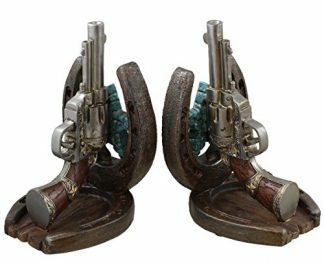 These Cowboy Revolver Bookends are also great gift items. It is appropriate for any occasions, from Christmas Day, New Year’s Day, Valentines’ Day, Mother’s Day, Father’s Day, weddings, anniversaries, and birthdays. Plus, it can be given both to male and female recipients. However, for a gun loving bibliophile, these bookends are going to be the bomb. Because let’s face it, it is seldom to find both hobbies in one amazing item. And these bookends have surely nailed it.